CD review: "I Am an Indian"
This review first appeared in the December 22, 1995 issue of the North County Times. Cello, percussion and saxophone do not constitute your average jazz trio. Then again, the Clusone Trio hardly claims to be average. Their often-dissonant and alwayls challenging music is not for background listening  you had better pay attention if you want to get anything out of it. 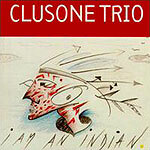 Regardless of how unexpected the Clusone Trio's versions of these songs might be, they stand on their own. Tight, organized and obviously part of a larger design, the arrangements swing, the playing is passionate and their execution is virtuosic. Their own compositions are even more into the realm of art jazz  and take yet more effort to fully appreciate as listener.